Sometimes I invite friends over to my house for dinnertimes and let them pick the dish. This particular dish was selected by my sistah from another mistah, Imani Cezanne (check her out on Verses & Flow!). I let JerVae (why are my friends so talented, tho? Check her out on the YouTubes) pick dessert, but that’s another post (FYI it was peach and candied bacon cobbler) and she brought her BFF David and we had a grand ol’ time! I love a good dinner party! Especially since I don’t have an actual dining room and we all have to sit Indian style (#dasracist) and eat on the couch. Oops. A note about tomatoes – I’m not a huge fan of tomatoes. At all. Especially out-of-season tomatoes. HOWEVER… roasted cherry tomatoes? Hi, I’m Holly and I’m your biggest fan! Roasting them allows some of the water in the tomato to evaporate and helps concentrate the natural flavors. If you are not a tomato fan, I highly suggest you try roasting some cherry or grape tomatoes! It might just change your mind! 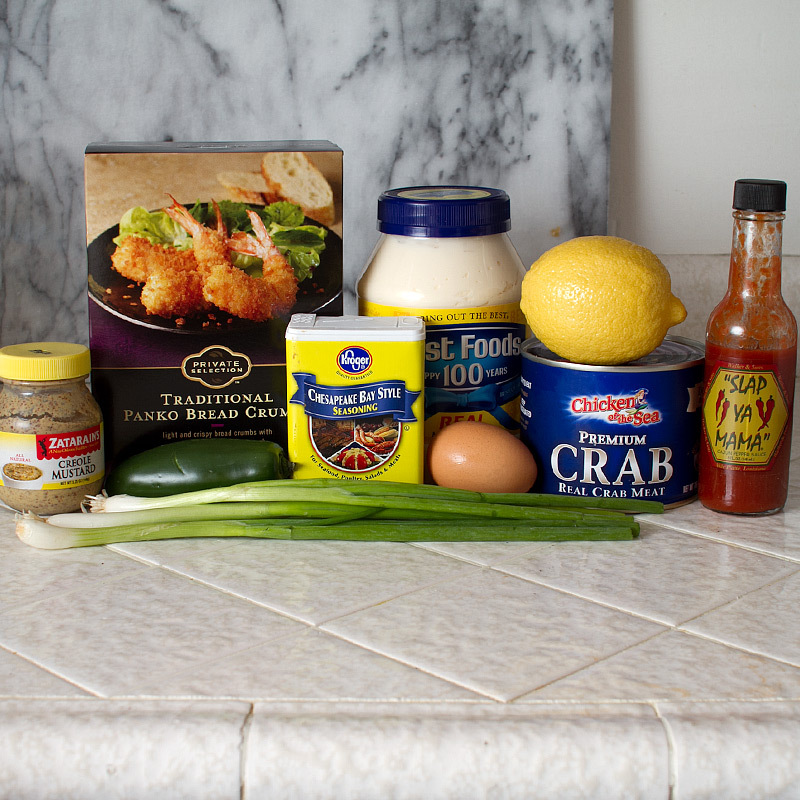 What you’ll need for the crab cakes: Mustard, panko bread crumbs, Old Bay seasoning, mayo, 1 egg, lemon, crab meat, hot sauce, scallions and a jalapeno. Not pictured: all the salad stuff (arugula, cherry tomatoes, parmesan cheese, another lemon, olive oil, salt, pepper, and avocado). Start by roasting the cherry tomatoes. Half them and place on a parchment lined baking sheet, cut side up. Drizzle with olive oil and season generously with salt and pepper. Roast at 400F for 20-25 minutes. Set aside and let cool. 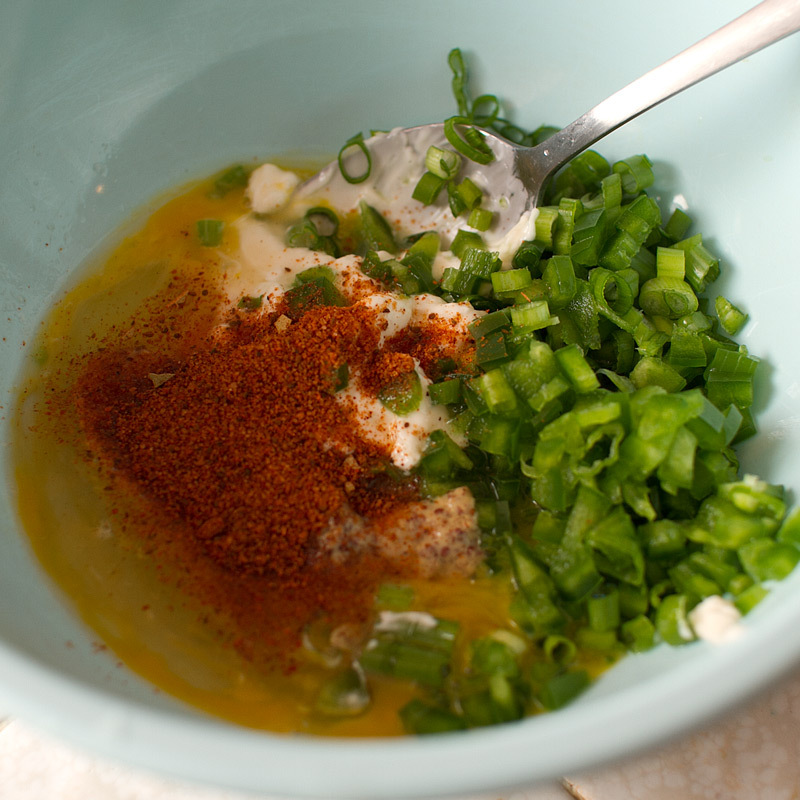 Combine the egg, mayonnaise, mustard, Old Bay seasoning, lemon juice, Worcestershire sauce, hot sauce, scallion, jalapeno and salt. 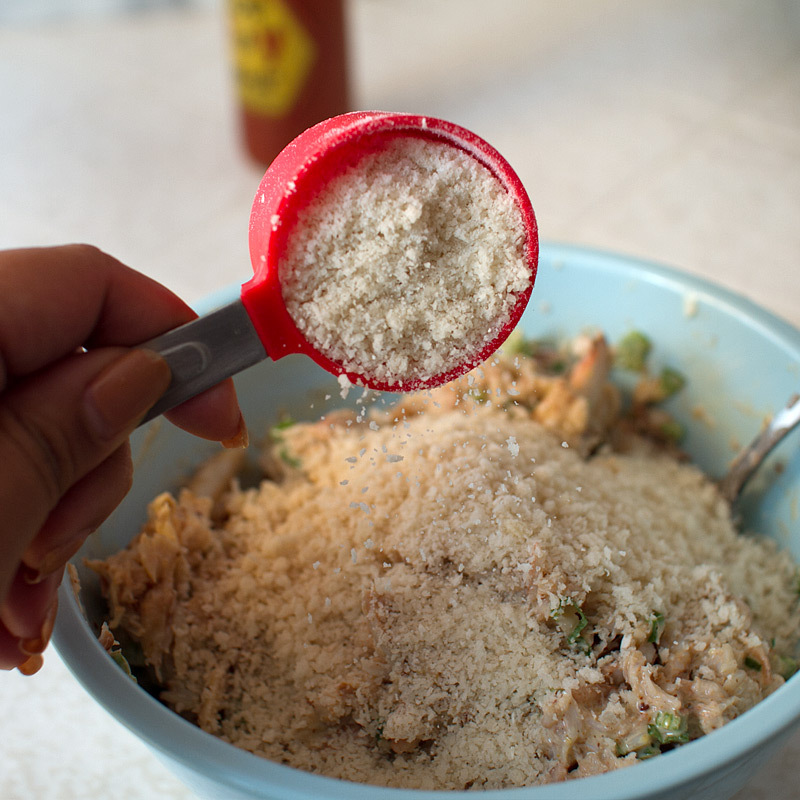 Add in panko and GENTLY mix. Don’t over work it, don’t over mix it. The mixture will be loose. Form into 8 patties and refrigerate. At this point, I was hosting and cooking at the same time and sort of forgot to keep taking pictures of the process. Whoops. 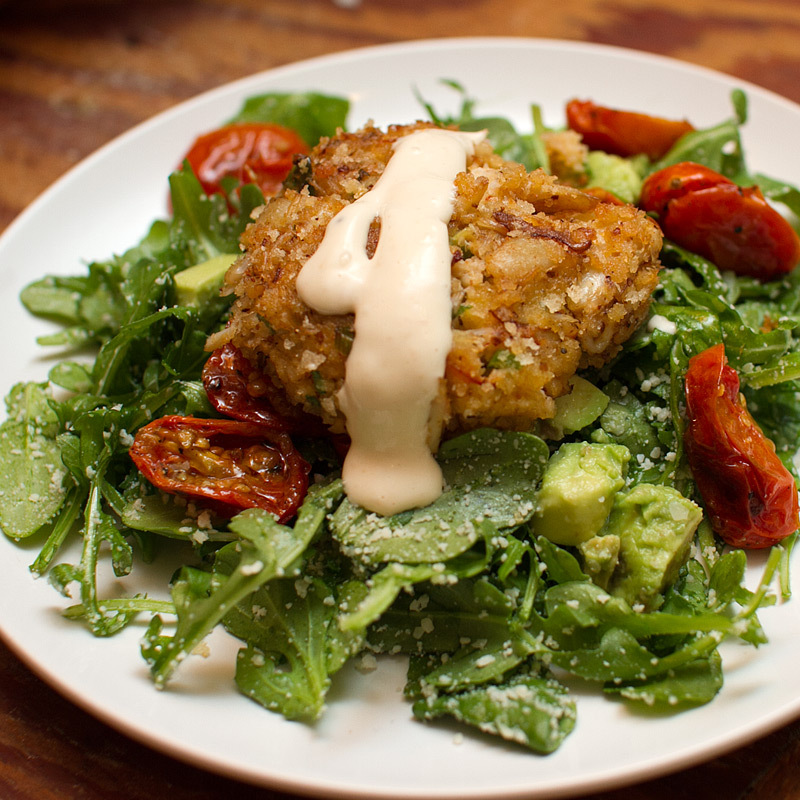 Fry the crab cakes, toss the salad… go ahead and follow the rest of the directions below, they’re all in there. 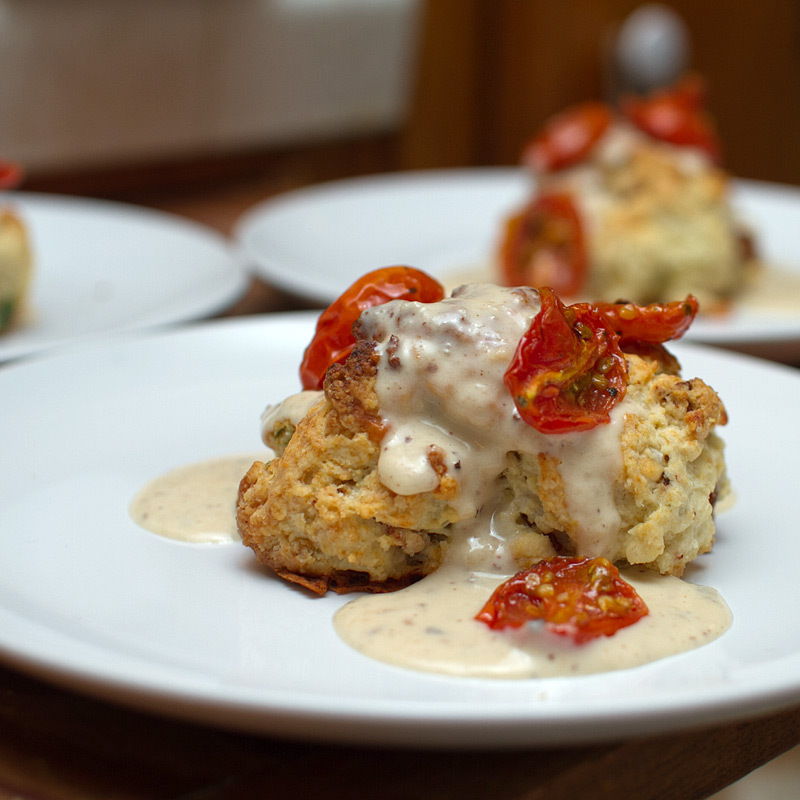 Tomato Tangent: Sometimes I like to add the roasted tomatoes to bacon cream gravy and serve it over gorgonzola and scallion biscuits. sometimes. Voila magic! 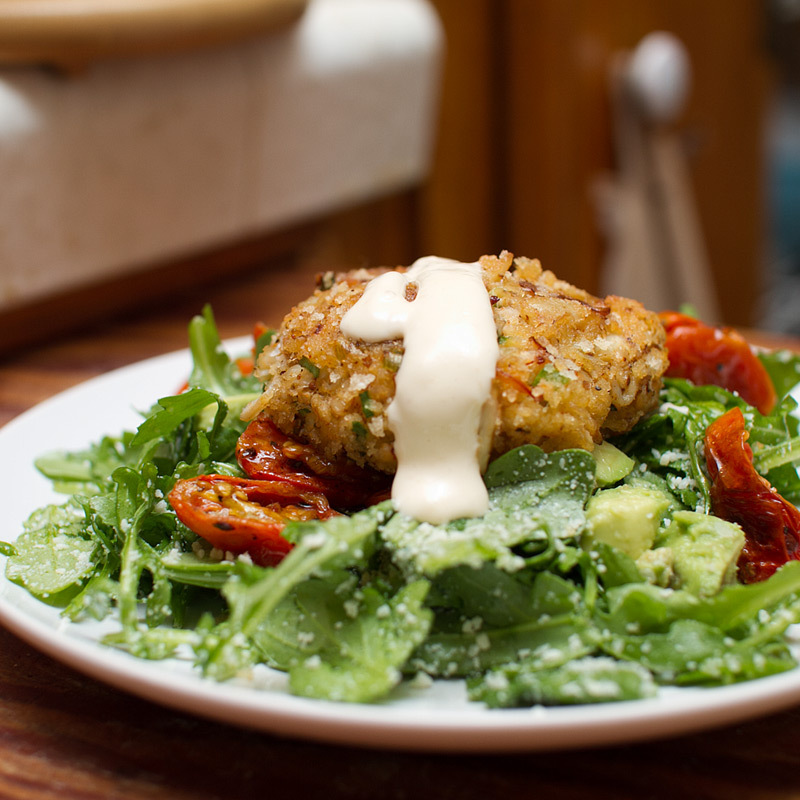 Serve the crab cake on top of the arugula salad (tossed with parmesan, olive oil and lemon juice, topped with roasted cherry tomatoes and diced avocado) along with a dollop of the garlic aioli. Combine all ingredients in a blender, food processor or use an immersion / stick blender. Set aside and refrigerate until ready. Preheat oven to 400F. 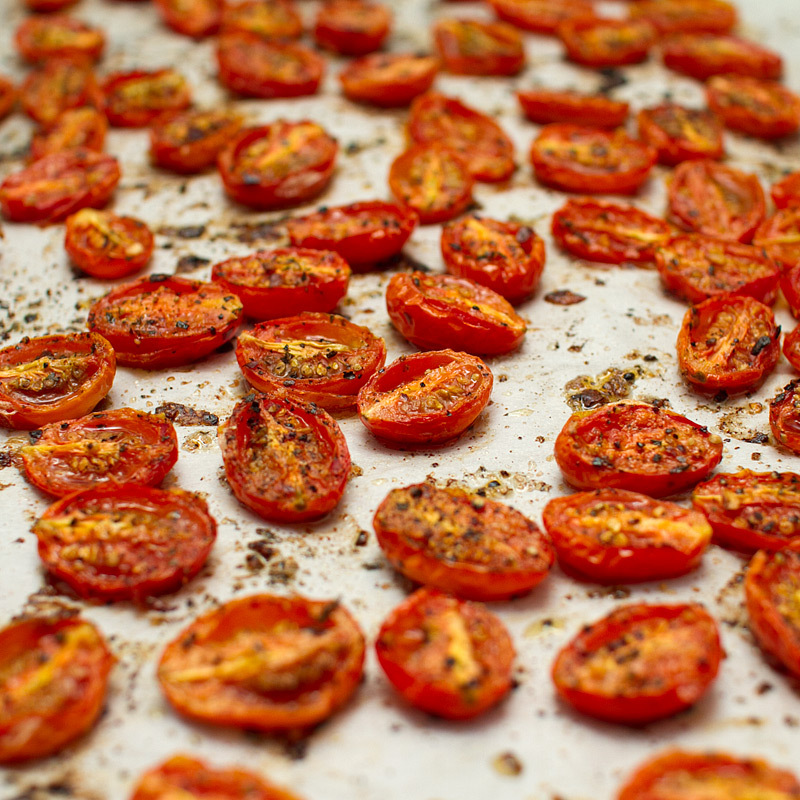 Place halved cherry tomatoes on a parchment lined baking sheet, cut side up. Drizzle with olive oil and season generously with salt and pepper. Roast for 20-25 minutes, until tomatoes have collapsed and have become soft. In a medium bowl, combine the egg, mayonnaise, mustard, Old Bay seasoning, lemon juice, Worcestershire sauce, hot sauce and 1/4 tsp. salt. Add in scallions and diced jalapenos and stir to combine. Gently fold in crab meat. 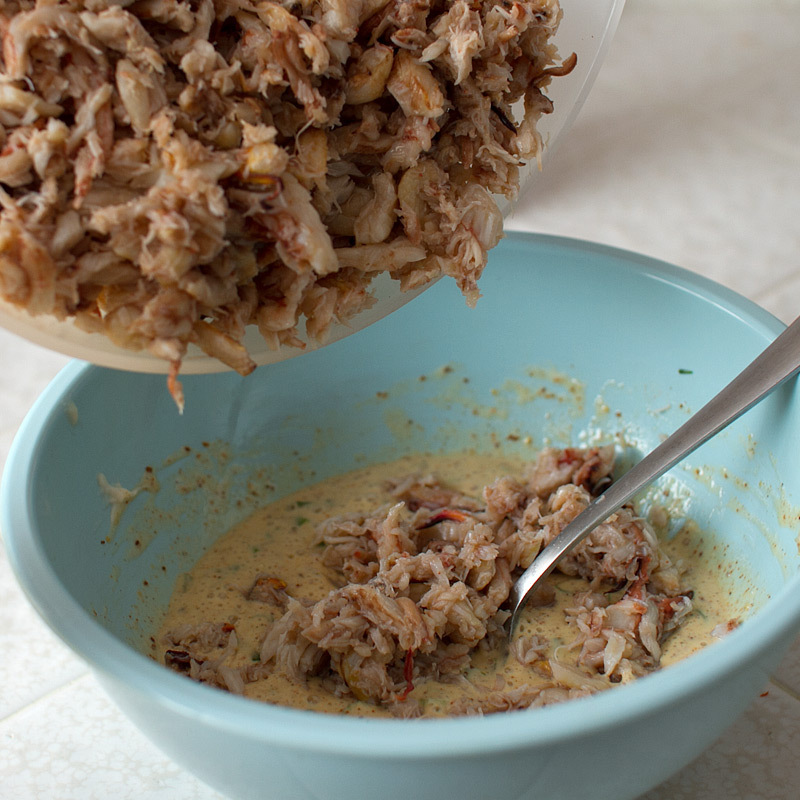 Sprinkle in bread crumbs and gently fold into crab meat mixture. Be careful not to over mix or mix too aggressively, the mixture should stay a bit loose. Shape into 8 equal-sized patties, about 1″ thick, and refrigerate for 30 minutes. In a 12-inch nonstick skillet, heat the butter with the olive oil over medium heat. When the butter begins to foam, add the cakes to the pan (8 should fit comfortably, but if not cook in batches). Cook until a nice dark brown crust has formed, about 4 minutes. 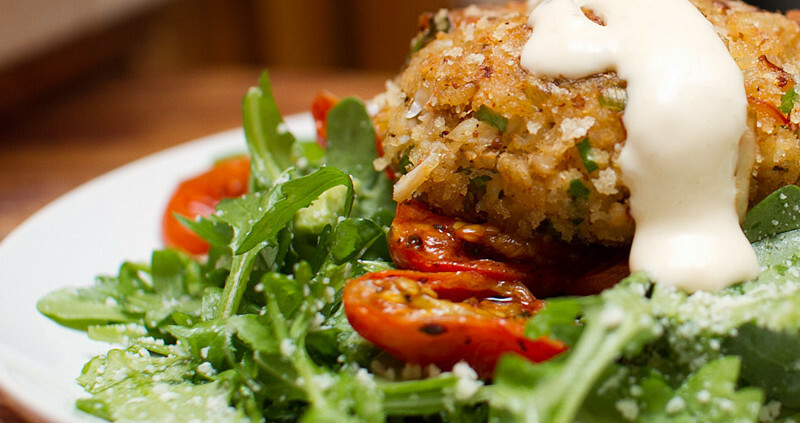 Flip the crab cakes and reduce the heat to medium low. Continue cooking until the other side is well browned another 4 to 5 minutes. In a large bowl, toss arugula with parmesan cheese, olive oil and the juice of one lemon. Add a good pinch of salt and a few grinds of pepper, to taste. Divide salad onto 4 separate serving plates and top with roasted cherry tomatoes and chopped avocado. 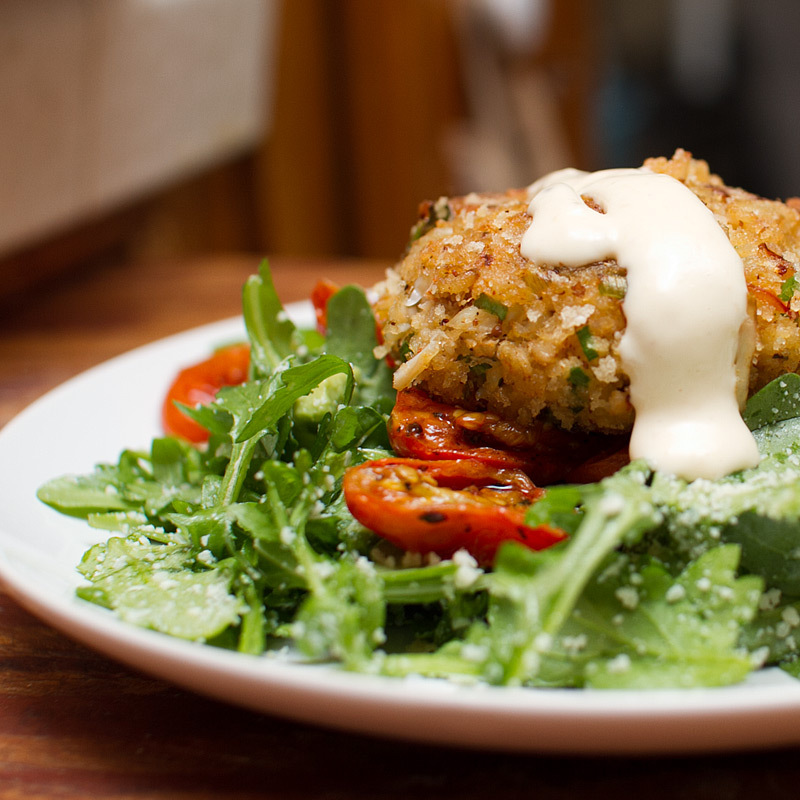 Top with crab cake and a spoonful of the garlic aioli.